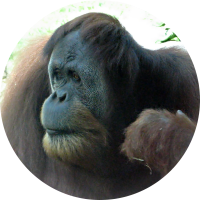 Unusual face and expression of a pongo orangutan ape. Great hairy orangutan ape looking bewildered. Cute orangutans playing in their habitat.